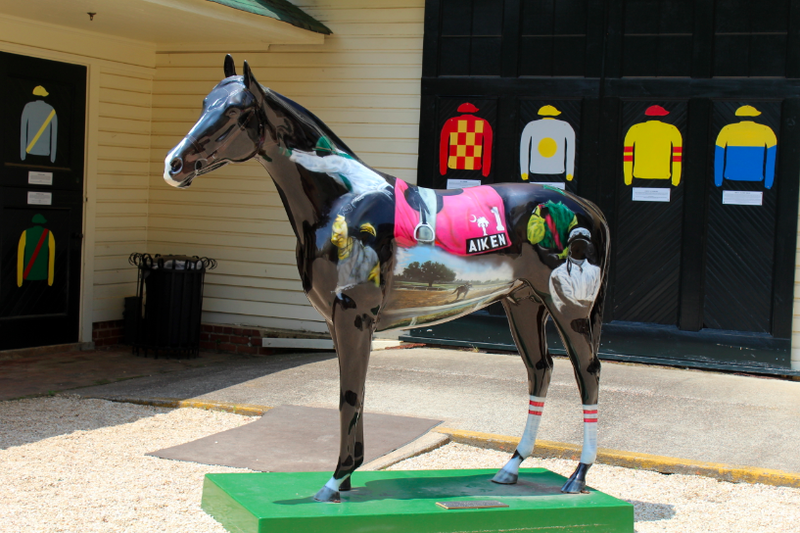 Aiken – a name that is steeped in rich racing history and glory for those who live and breathe the sport of kings, and yet will often draw a blank for those who know little of the racing world. 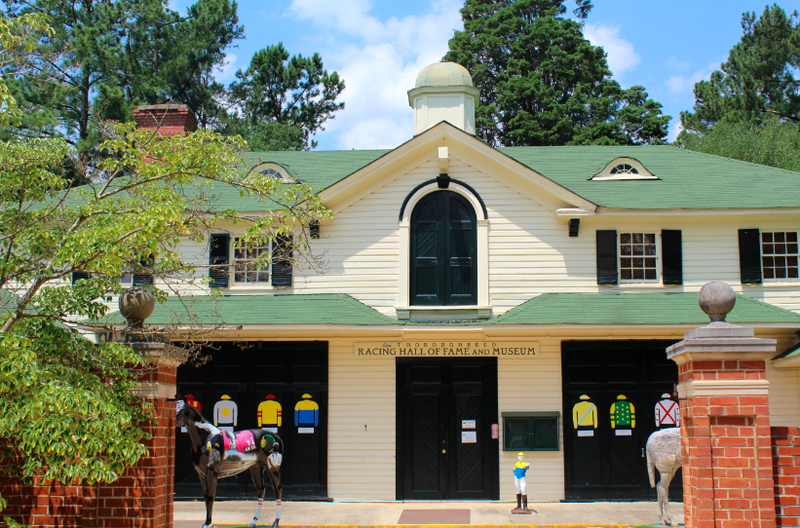 But I can guarantee that racing aficionados and novices alike will fall in love with Aiken when they spend a day wandering around the horse district. 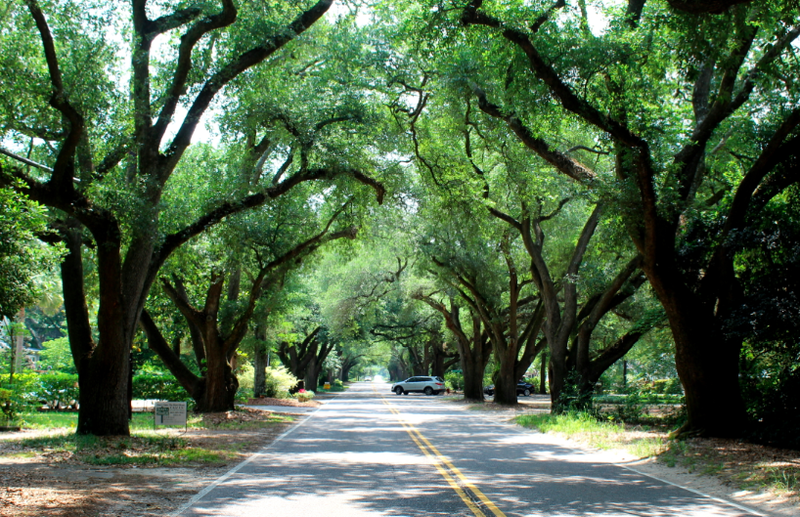 Narrow red earth roads lined with live oaks forming tunnels so the only light that filters down is a pure green. 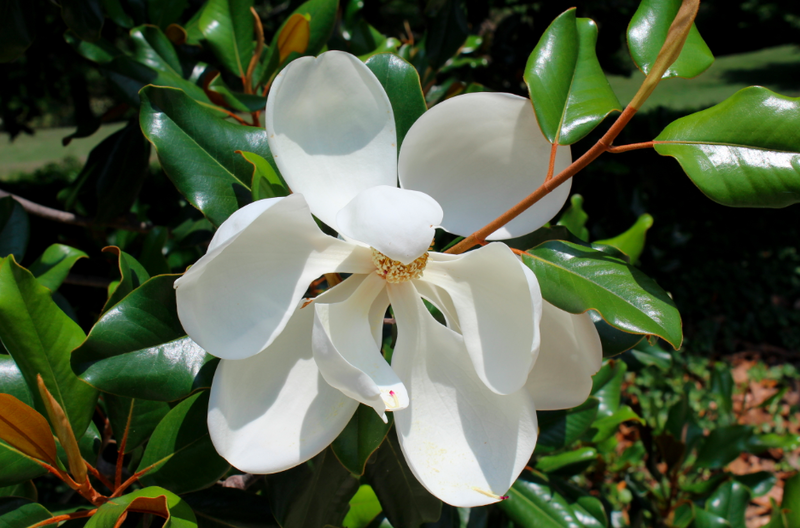 The houses are wooden panelled, all painted in white with intricate wooden porches, each with a garden filled with magnolia trees, the flowers so big the branches seems to bow down under the weight of those soft white, sweet scented jewels. 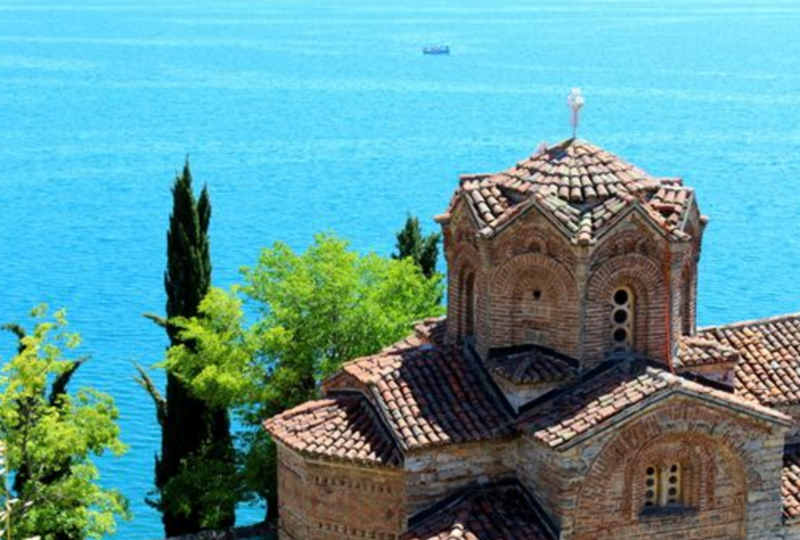 There is a feeling of absolute peace and contentment here. Winston Churchill said that ‘there is something about the outside of a horse that is good for the inside of a man‘. It is no wonder then that the people here seem so happy, living in an oasis of beauty that is filled with opportunities to view the outside of horses – a true paradise. I visited Aiken from Augusta, Georgia with my dearest friend Edna and her daughter Katie. As we drove closer and closer to the Aiken Thoroughbred Racing Hall of Fame & Museum, I sat with my hands pressed against the windows of the car, my jaw wide in disbelief that such a beautiful place could truly exist. We arrived at Rye Patch, a graceful home that once welcomed King Edward and Wallis Simpson for a season and now exists both as a wedding venue and the office to Lisa Hall. 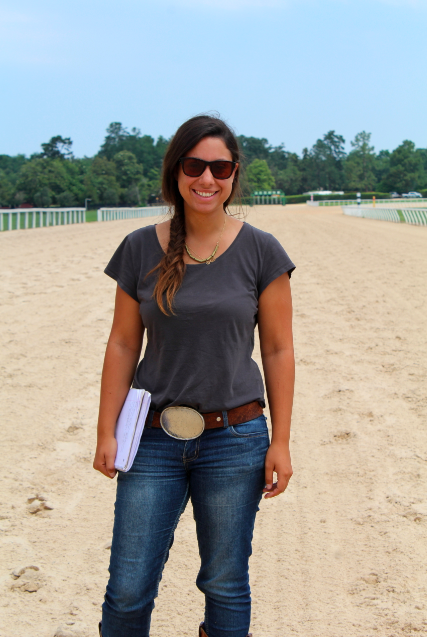 Lisa is not only the museum coordinator but an incredible lady whose love and dedication to Aiken Racing is evident in the fact that she took nearly 4 hours out of her day to show us around this incredible place. The Aiken Horse District is a large and sprawling area made up of private homes (often with stables) and big racing stables, many of which were originally owned by the most famous American horse families. 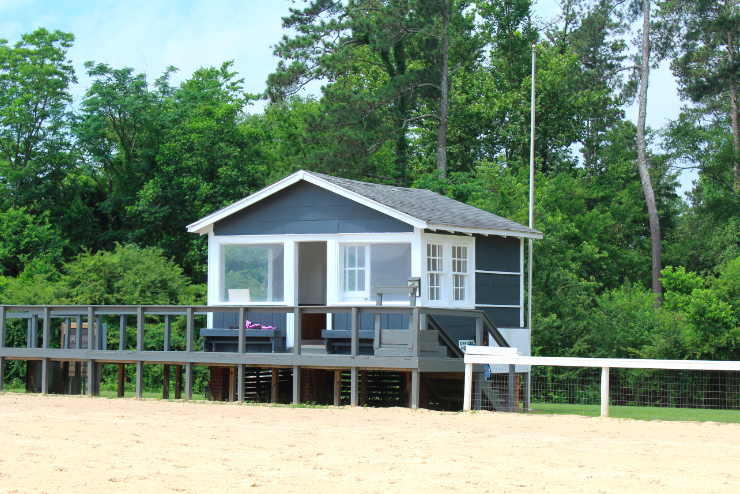 We headed first to the little grey wooden offices of the Steeplechase Association and the Aiken Training Track. There we met a great nephew of the famous Ambrose Clark or ‘Brose’ as he was nicknamed by those who knew him. Ambrose Clark was one of the famous horsemen of 20th Century America and spent 60 years breeding and training his horses for steeplechase, polo, flat racing, driving, show jumping and hunting at his stables, one of which was in Aiken. A man who it was said looked like he ‘stepped right out of a 19th Century sporting print’ as he almost always wore a tweed flat cap, waistcoat, breeches and tall boots. 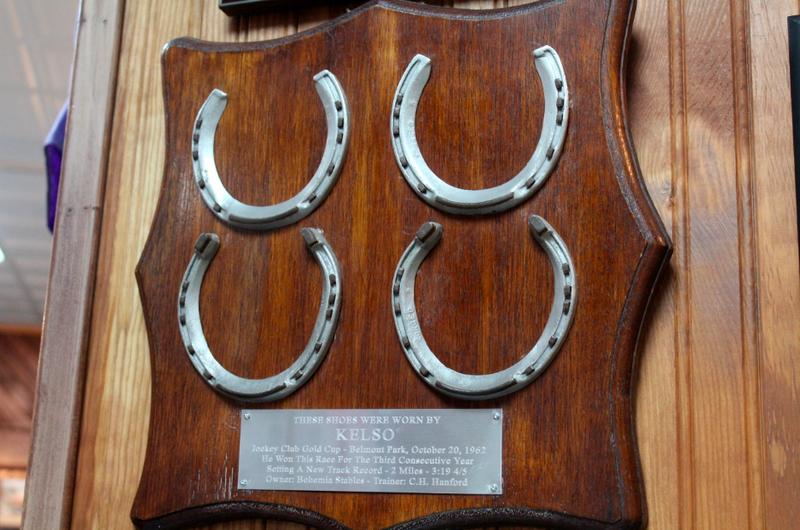 One of his best horses was Kellsboro Jack, which he sold to his wife for $5.00 the night before the horse won the 1933 Grand National and set a record, finishing in just 9 minutes and 38 seconds. When Ambrose Clark died, he was buried next to his beloved Kellsboro Jack outside Cooperstown, NY. Aiken Training Track is presided over by Brad Stauffer, who was kind enough to spend his time showing us around the Dogwood Stable and introducing us to his horses. But how does one man take an untouched, untamed creature and transform it into a future champion? Me: Tell me a bit about how you start the training process? Brad: I start off by just putting a halter on the horses in the stall and walking them around the stall using voice commands such as ‘whoa’ and ‘walk on’. We’ll always stop in exactly the same place. How long that lasts will always depend on each individual horses, but usually lasts a couple of days. I’ll then rub them down with a towel, showing them the saddle and the bridle and after about two weeks or so we’ll move out to the track. Me: Do you ride the horses? Brad: No, we always work with training riders, and when they first climb up into the saddle, I’m there by the horse, the person that they trust. If I’m by their side, they know it’s ok because they know me. Me: Have you always been around horses, was it a family trade? 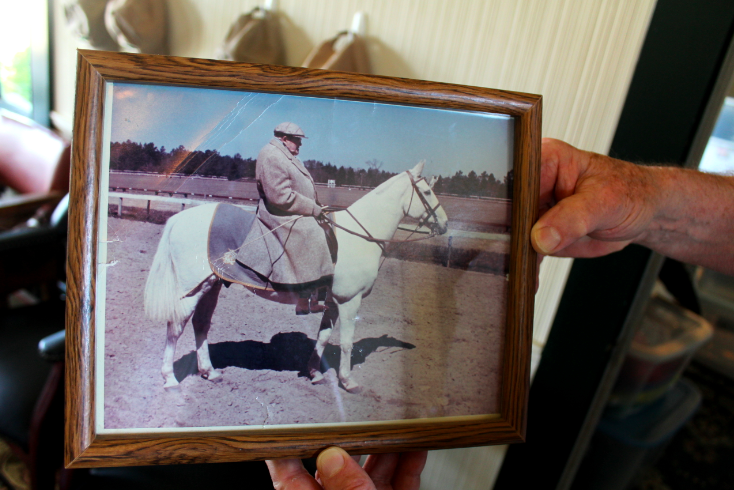 How did you end up as President of the Aiken Training Track? Brad: Actually no, my parents were music teachers and I grew up in an Amish neighbourhood in Pennsylvania, but I’d always been fascinated with horses so I went to New York to attend a two year equine science degree. My first job was taking care of a little farm which had a few show horses, brood mares and race horses that I’d take to and fro the breeding farms. That’s how I got into the horse racing side. After that I had a few other jobs before joining a big racing farm and part of my job involved taking the horses down to Aiken to train during the winter when it was too cold for them on the farm. I met a South Carolina girl and never left! Me: What’s Aiken like as a training ground? Brad: Aiken is like no other track in the world. The temperatures are such that we never miss a days training – if it freezes, it’s gone by midday. Aiken has the right sand too, it’s very conducive for training as it’s good for the horses feet and physique. It has a good location, so the track has an all natural surface: a 4-6 inch red clay base with 6 inches of sand on top. We used to call it sugar sand as it’s so sweet on the horses feet (and it has a consistency of brown sugar). Me: Do you have any horses of your own? Brad (laughing & gesturing the stables around him): These are all my horses! The horses at Aiken are absolutely beautiful (I mean what else would they be!) They’re the crème de la crème of American Thoroughbreds, the debutantes of the racing world, but I was still so awed by the silkiness of their perfectly groomed fur, the fineness and elegance of their poise and form and their sweet tempers and curious natures. 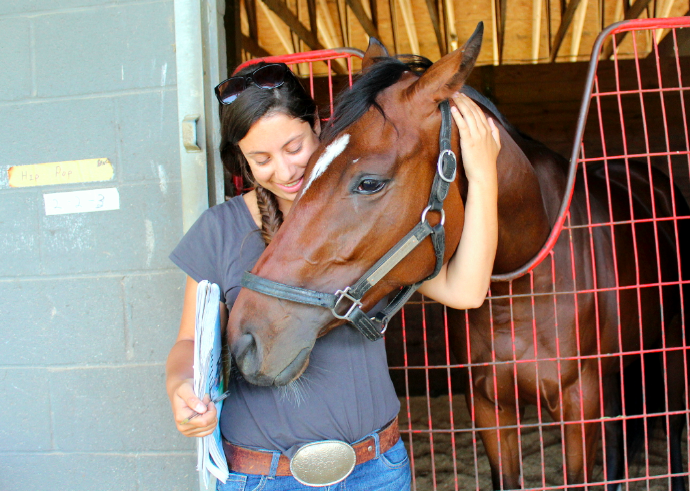 Thoroughbreds are so often negatively portrayed as nervous, skittish and unpredictable creatures, but you can see that these horses are loved by their trainer and therefore love back. 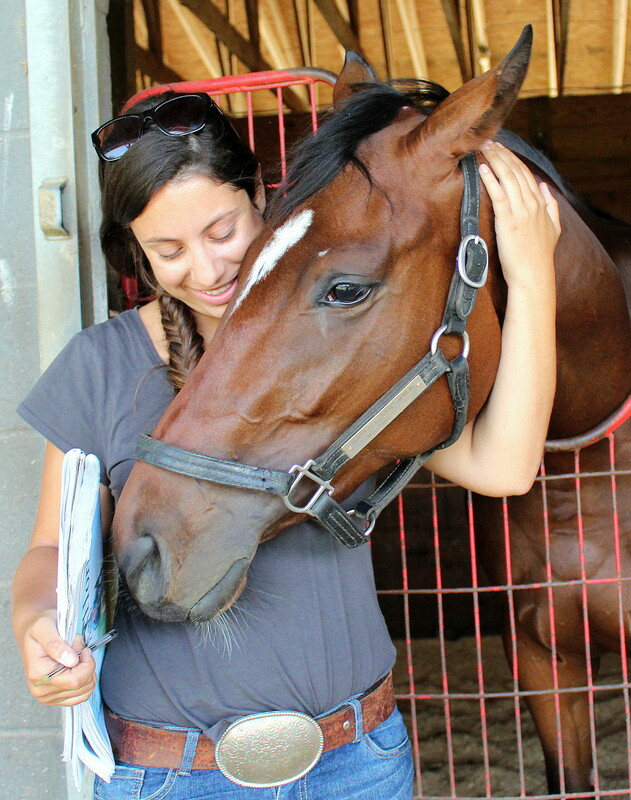 My favourite horse I met was a beautiful bay called Hip-Pop who I immediately fell in love with. Apparently her owner, aged 86, and his best friend, aged 87, both popped their hips within the same month he got the horse, hence the name. She was the sweetest thing, nuzzling my cheek and neck and loving all the attention. Remember that name, my heart tells me that she will be a star someday. After saying farewell to Brad (and prising me away from my new horse love), we moved on to see the famous Training Track which is home to the Aiken Trials. The trials were started in 1942 and are held in March every year – it’s a chance for 2 and 3 year olds to race in front of a crowd for the first time. There are six races in total – five races for two year olds and maidens (horses that may have started in a race, but have never won), running a ¼ mile to 4 ½ furlongs, and one race for older horses that have already won. The training riders are the jockeys which gives them a chance to be centre stage for once rather than just behind the racing scenes. The Friday before the Trial, the race track hosts the ‘Breakfast at the Gallops’ where for $20, guests get a full breakfast and get to chat and mingle with trainers, owners and riders who are happy to answer any questions. Sounds like the best best breakfast in the world to me! 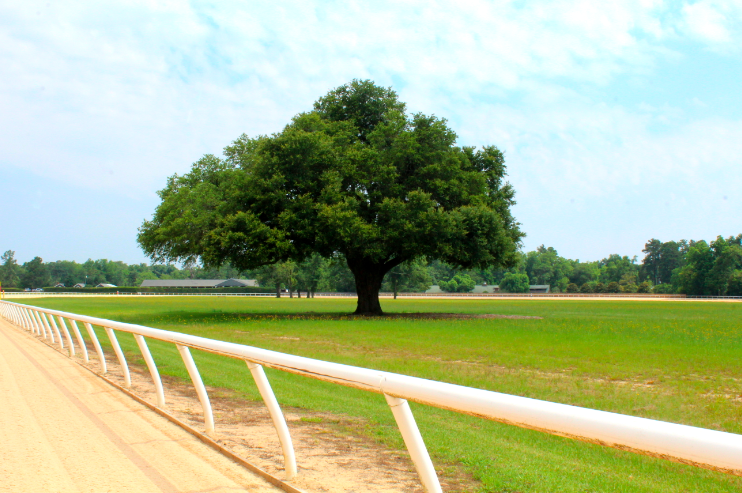 One of the most iconic views of Aiken is of Blue Peter’s tree with the track in the foreground. This ancient live oak has been named after the famous American Race Horse who is now buried beneath it. 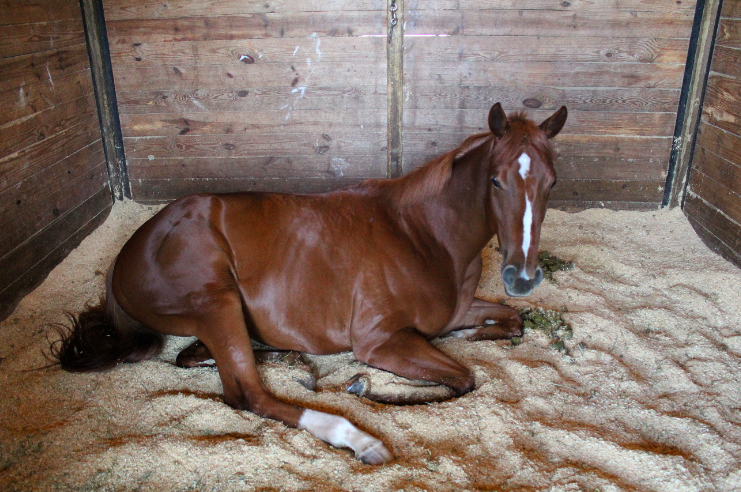 A race horse who might have been one of the greatest yet was buried here last Friday. 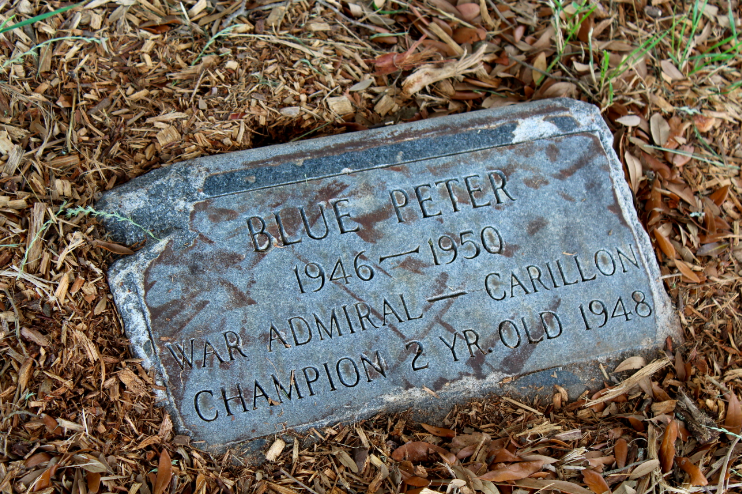 In the first ceremony of its kind to be held here Blue Peter, was laid to rest in the infield of the Training Track. 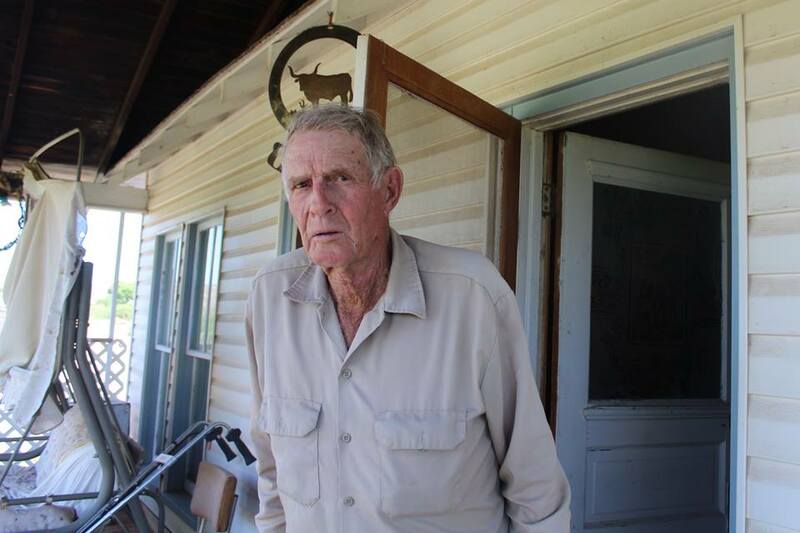 His six-foot grave is under a large oak tree. Blue Peter was placed in a large pine coffin and his body was covered with a yellow and red blanket which was monogrammed with the owner’s initials J. M. R. The coffin was lowered into the grave by the means of ropes. 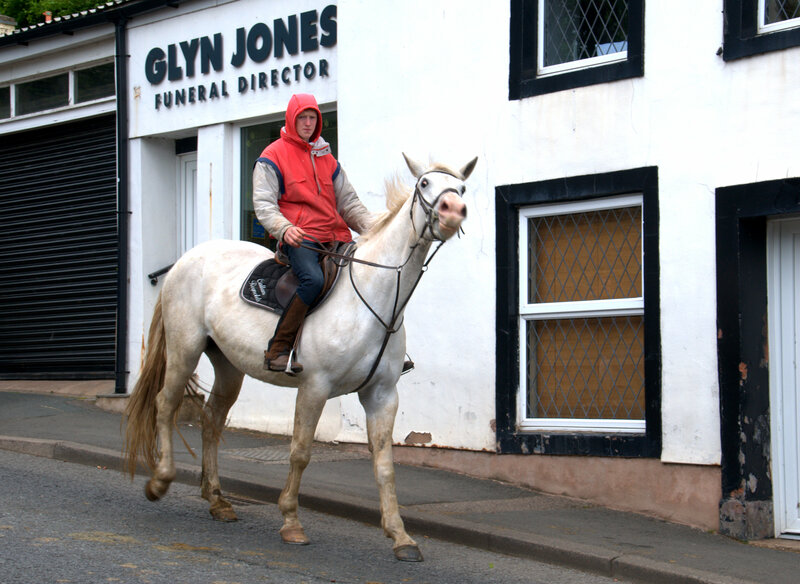 Some 25 or 30 horse fanciers attended the funeral. As the horse was lowered into his grave many of the spectators wept. The grief was seen most in Trainer Andy Schuttinger who considered Blue Peter the best horse that he had ever trained. It was Schuttinger who trained this horse who was almost unanimously declared the best two year old in 1948. 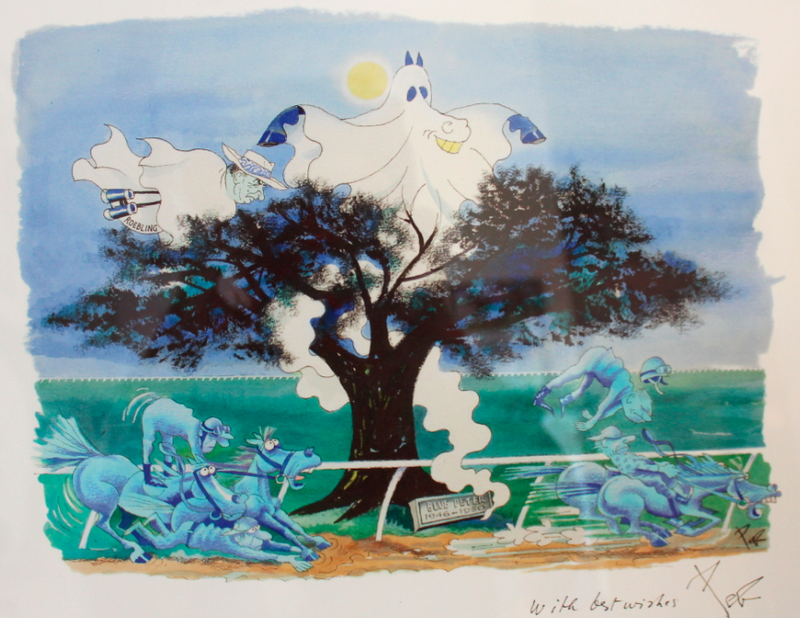 There is a rumour that the ghost of Blue Peter haunts the track, which started when famous cartoonist Pierre Bellocq who drew for the Racing Post came and drew a cartoon of Aiken with Blue Peter’s ghost and owner rising above the tree and spooking the other horses. The photo below is the original painting that was gifted to Lisa by Pierre along with a beautiful painting of a horse especially for her, which shows just how special a person Lisa is. The track (and indeed the whole Aiken horse district) is open to the public to ride and wander around (other than going to the stables) so if you happen to pass by Aiken you can go and watch the horses training in the morning so long as you are respectful. That means having your mobile phones on silent, keeping quiet and calm (no crazy movements when the horses are passing by), no cameras with flashes or loud clicks. 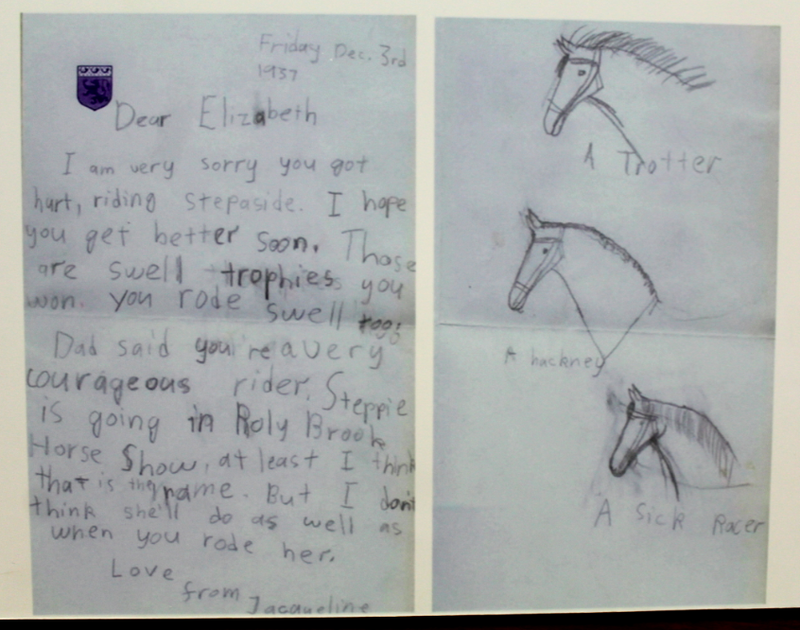 It’s important to remember that these horses are, after all, still learning! The training usually takes place from 7.30-8.30am then they take a break and again from 9-10. The track has an all natural surface: a 4-6 inch red clay base with 6 inches of sand on top. 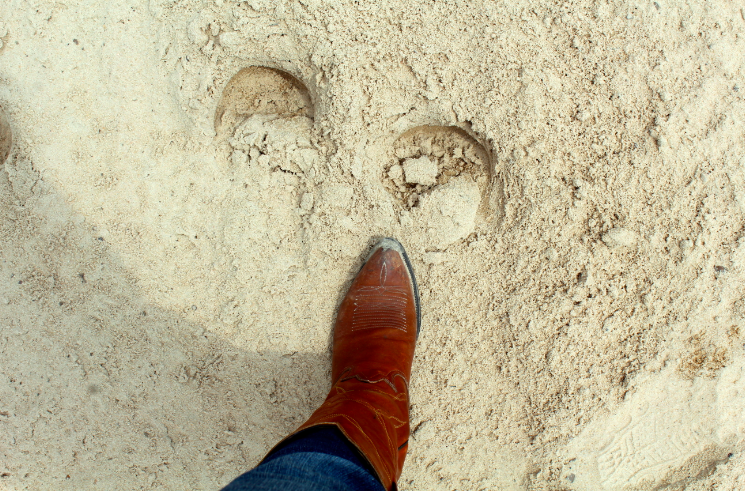 We used to call it sugar sand as it’s so sweet on the horses feet (and it has a consistency of brown sugar). It was such an honour being able to walk on the same track where champions have run. Standing there in the middle, I closed my eyes for a moment and felt like I could hear the pounding of hooves galloping past me. 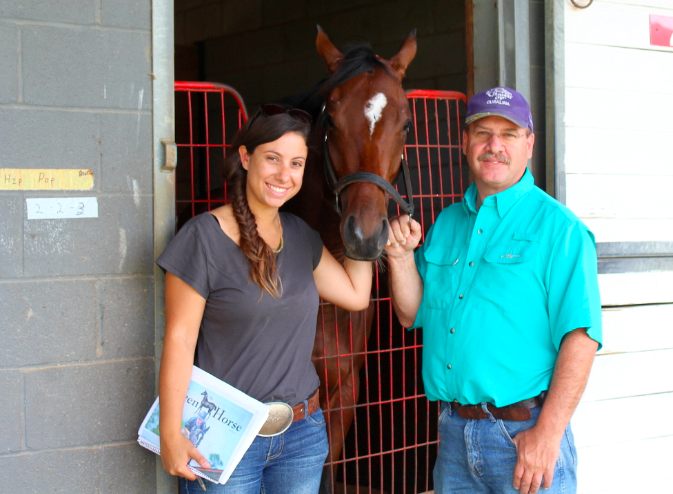 There’s a lot of maintenance that goes into providing a solid foundation for Aiken’s Thoroughbred athletes. A properly prepared track that is uniform throughout its course should positively influence the performance and health of the horse. When a horse runs on a track, the surface becomes compacted under the weight of the horse (on average 500kg for a thoroughbred!) A compacted track will strongly increase the force pushed on the horses limbs so maintenance staff will harrow (break up and smooth out the surface), water and adjust the composition of the track. Tracks like Aiken made of dirt or sand will be affected by the rain too. Before it rains the track has to be sealed (rolled with heavy machinery) to pack t down so the rain flows off and isn’t absorbed into the dirt. Once the rain has finished the track has to be opened by harrowing to let it dry. 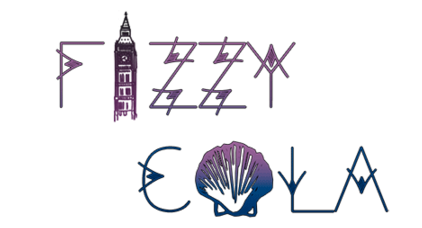 Tuesdays – Fridays 2 – 5 pm, Saturdays 10 am – 5 pm and Sundays 2 – 5 pm. 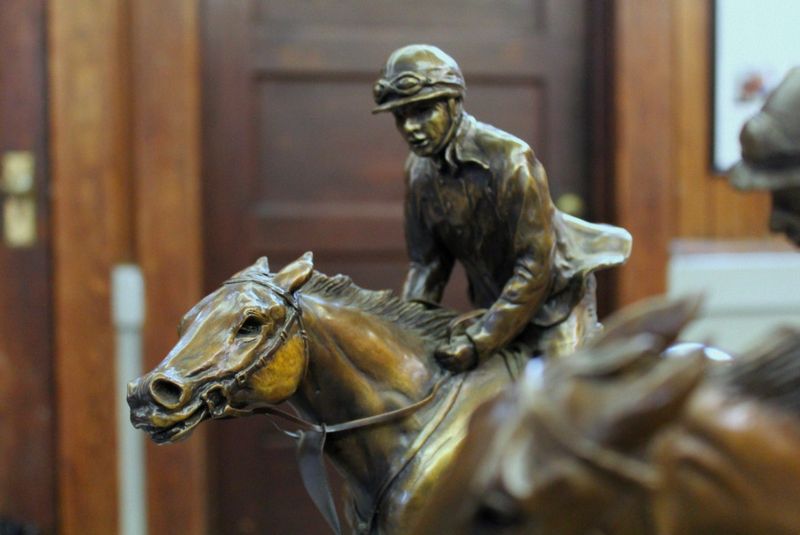 The Hall of Fame Museum was started as a place to establish a lasting tribute to the incredible horses that had been trained at Aiken and the history of horses and racing in Aiken, South Carolina. The current museum is housed in the Carriage House, which was built in 1902 in Hopeland Gardens, a public garden owned by the City of Aiken. You can’t help but be bowled over by this charming white wood building with green rooves and the jockey silks painted on the carriage doors add a charming and colourful touch. 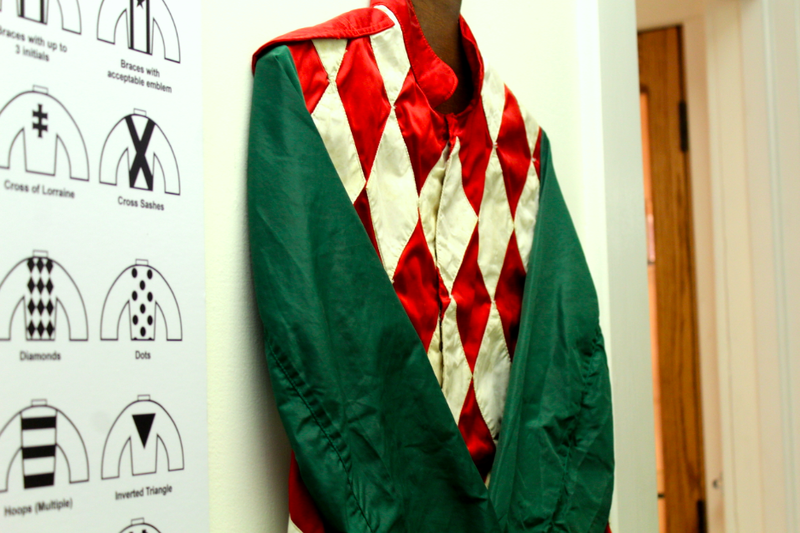 Most of the photos, trophies and silks in the Hall of Fame were donated, and are laid out on the first floor in an incredible exhibition which really underlines just how many champions have come Straight Outta Aiken. 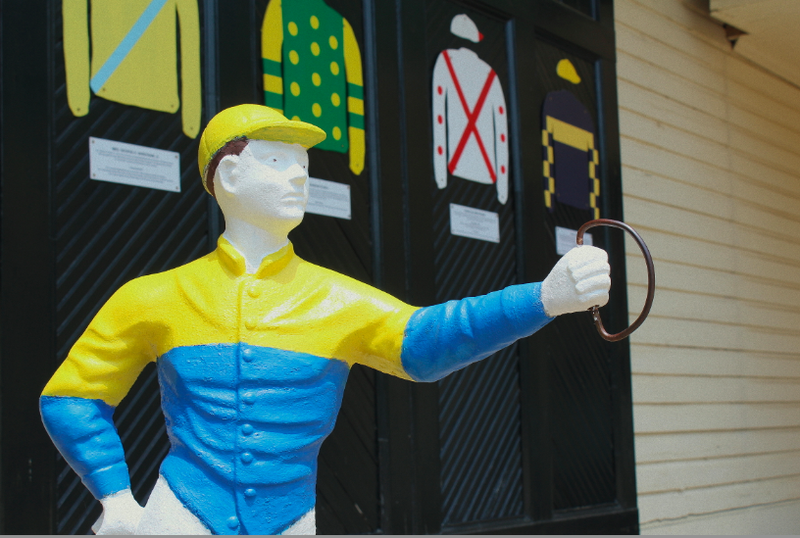 In the photo below you can see one of the many lawn jockeys at Aiken displayed outside the museum. Lawn jockeys have a controversial history, though many accounts of its origin see the figure as representing an African American hero. It is said that the ‘lawn jockey’ has its roots in the tale of one Jocko Graves, an African-American youth who served with General George Washington at the time that he crossed the Delaware to carry out his surprise attack on British forces at Trenton, NJ. The General thought him too young to take along on such a dangerous attack, so left him on the Pennsylvania side to tend to the horses and to keep a light on the bank for their return. So the story goes, the boy, faithful to his post and his orders, froze to death on the river bank during the night, the lantern still in his hand. The General was so much moved by the boy’s devotion to his duty that he had a statue sculpted and cast of him, holding the lantern, and had it installed at his Mount Vernon estate. He called the sculpture ‘The Faithful Groomsman’. This award is voted on by the National Turf Writers Association, Racing Track Officials, and writers/editors from the Daily Racing Form. Any horse who has run at least one race in North America is eligible to be nominated for an Eclipse Award. 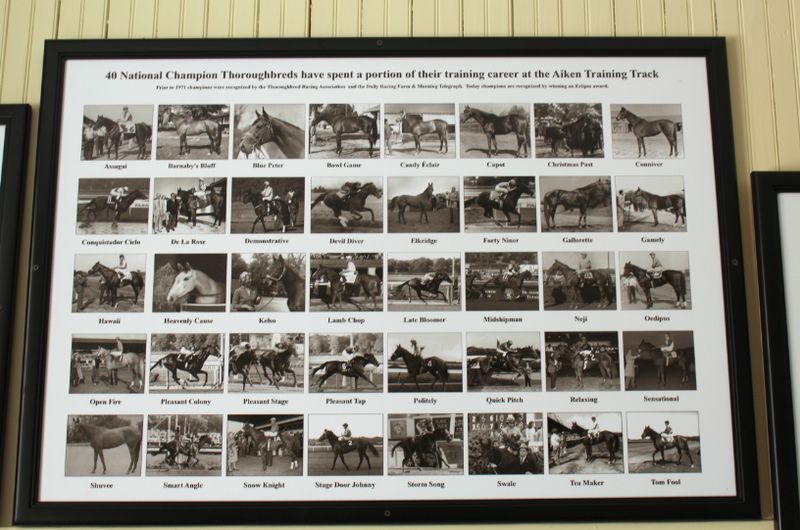 There are 40 horses in the Aiken Thoroughbred Racing Hall of Fame which you can see in the photo above. 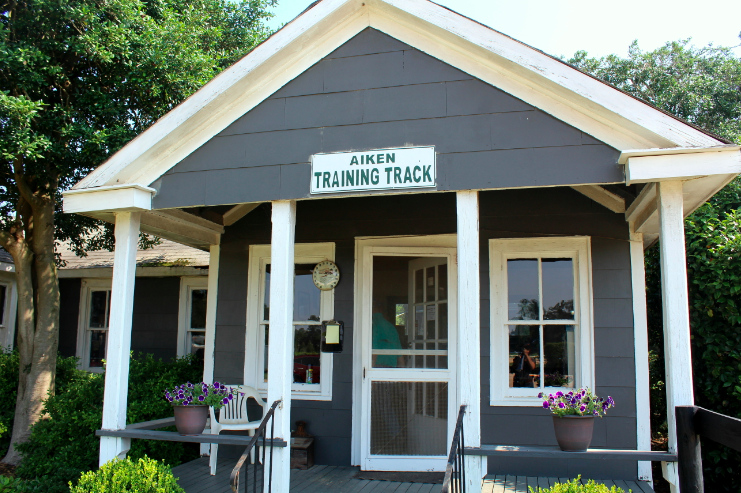 Such an impressive number of champions shows clearly that Aiken is without a doubt an unparalleled training facility. Names like Blue Peter, Politely and Tom Fool will be very familiar, although my favourite of the Aiken Champions is a horse I hadn’t heard of before with the best name ever: Lamp Chop! How great is that! The museum has room after room, corner after corner of fascinating racing memorabilia and interesting information. 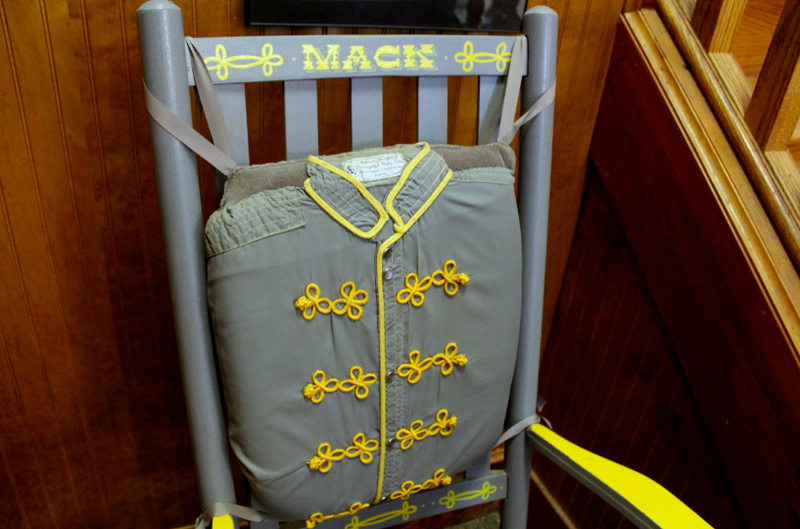 I loved this old rocking chair that once belonged to Mack Miller (Hall of Fame trainer and owner) – what a lovely idea to sew the jockey silks onto the cushion and paint the chair in the silk colours. 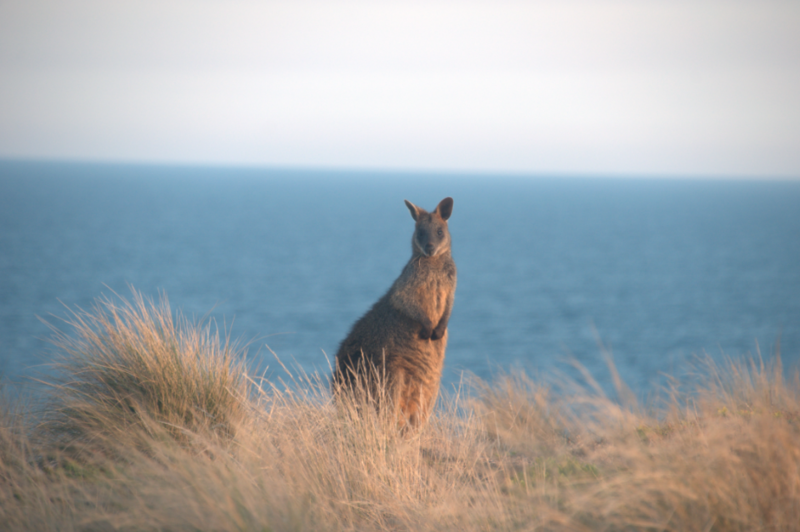 I rather want one of my own now! 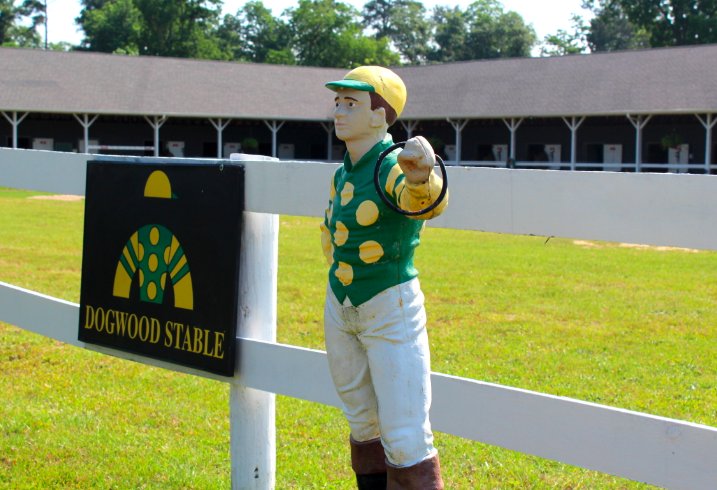 Upstairs there is a room dedicated to the Dogwood Stable which has had eighty stakes winners, seven trips to the Kentucky Derby, both a Preakness and Belmont winner, seven millionaires, two Eclipse Awards and a Breeders’ Cup victory – just some of the immediate highlights of Dogwood Stable. 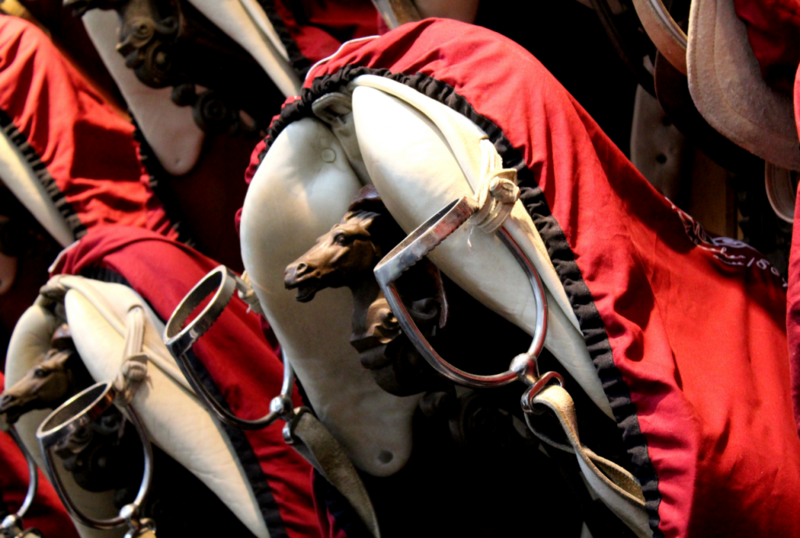 For those who have kids, there’s a big area of the museum for kids to indulge their love for horses with a selection of hobby horses and rocking horses as well as more informational models on horse anatomy. I always think it’s great when there’s a place for kids to interact with. 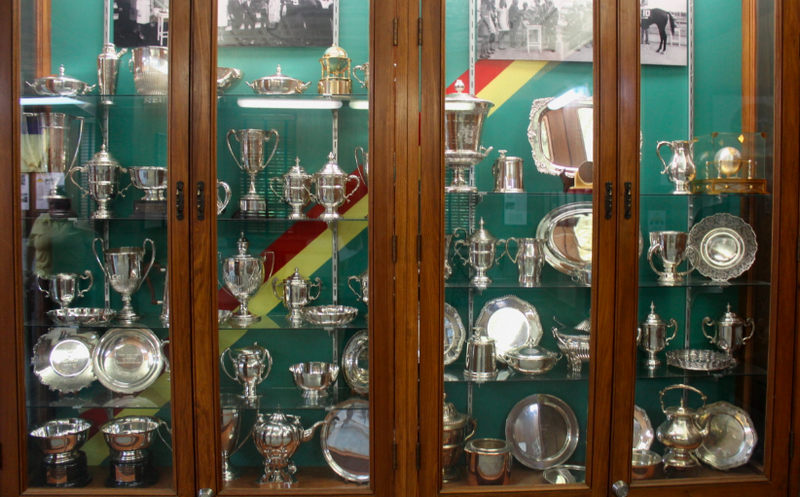 A museum that is dedicated to the champions that have been a part of Aiken’s history would not be complete without some of the trophies those champions won. 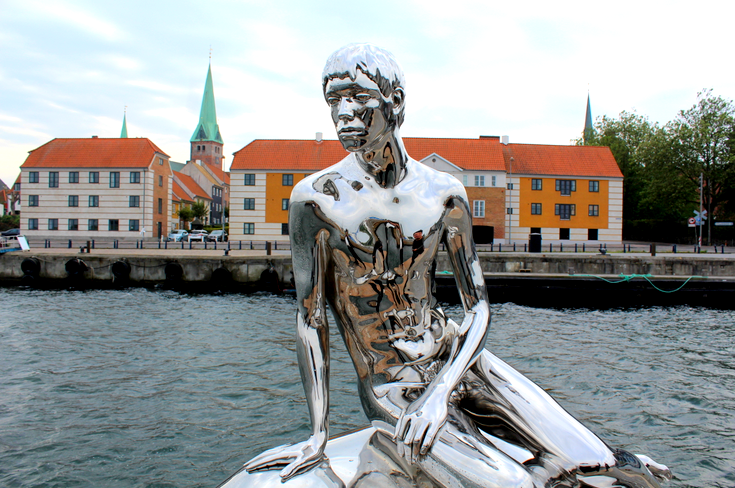 You will certainly not be disappointed for in every corner of this museum silver shimmers and shines out at you. I’m not sure who has been polishing the trophies, but they’re doing a wonderful job! Of all the medals, I like the Julep Cups best, I think because we don’t get them at home in England and there’s something exciting about the idea of winning a medal you can then have a celebratory cocktail out of. One of the cabinets is filled with Julep Cups from Cragwood Stables. All of them were won from 1961 -73 by Cragwood Horse and were all trained by Mackenzie Miller. 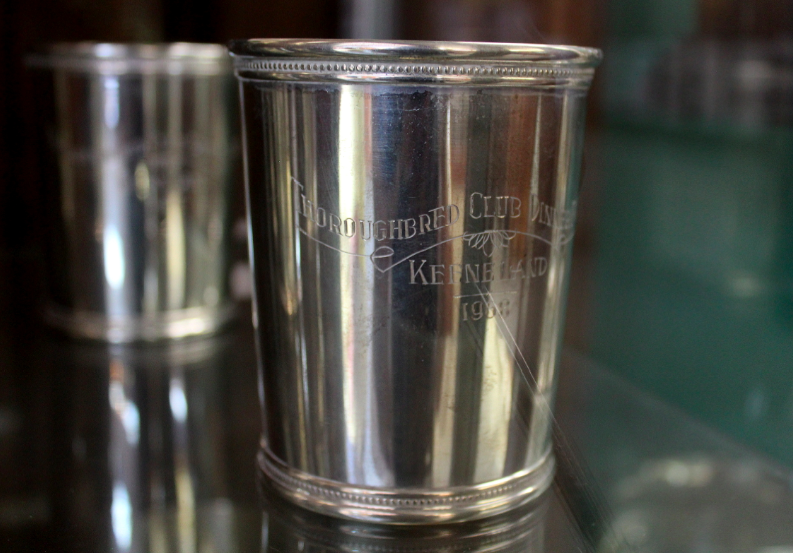 The Julep cup should be filled with bourbon, sugar, ice and mint for a true Southern drink! We finished our tour back at Rye Patch once more and took a wander around the beautiful Hopeland Gardens before leaving. 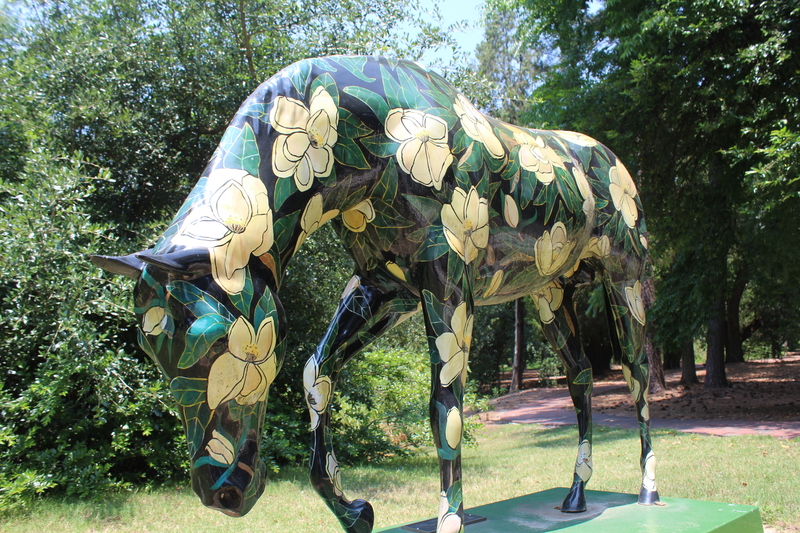 I really wanted to go and see the Magnolia Mare – one of the many art work horse sculptures around the city. In 1897 the land that now forms Hopelands was sold to a Mr Iselin for $1,650. His wife, Hope was known as ‘the great lady of racing’ for her lifetime love of and interest in thoroughbred horses. She had racing stables in the US and every year headed over to the UK for the racing season there. Oliver and Hope Iselin built their winter home in Aiken around the turn of the century. Mrs. Iselin began developing the gardens shortly thereafter. Although the family spent only winters in Aiken, she put love and care into creating an atmosphere of tranquility and beauty. 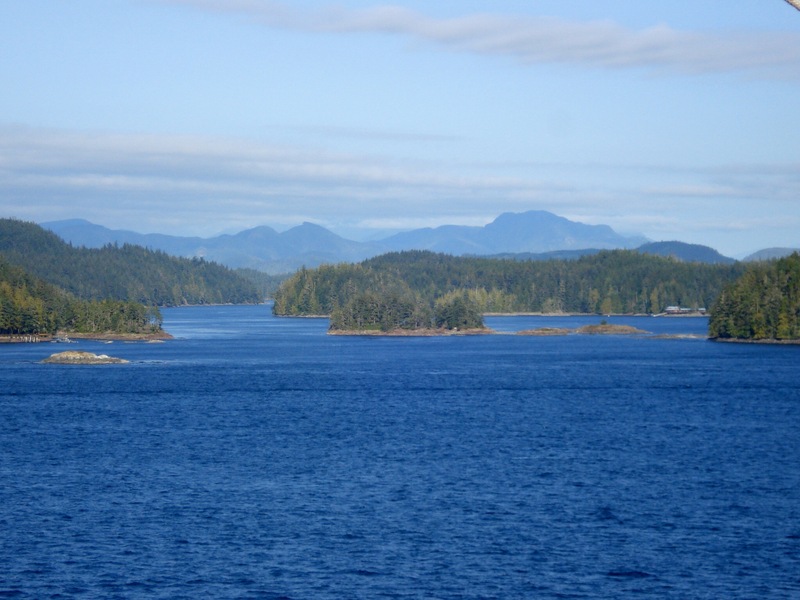 It is believed that Mrs. Islein planted the deodar cedars and live oaks that still grace Hopelands today. After her death in 1970 at the age of 102, Hopelands was bequeathed to the City of Aiken. The gardens are a peaceful haven of beauty with magical watery pools filled with white water lillies and reeds and the most enormous fish you’ll ever see. It’s a peaceful place to spend an afternoon sitting on one of the benches and letting go of the woes of life. I personally can’t think of more special way to spend a day than here at Aiken – a must for all race horse lovers around the world! A big thanks to Lisa Hall and Brad Stauffer for showing us around and to the lovely Edna and Katie for driving me all the way there and enjoying Aiken along with me. Sarah You did a great job with this article! I really enjoyed reading it. I was raised in Aiken and have been training thoroughbreds down here for the last 15 years. Aiken is everything you said it was!! Thanks so much Glenn! You sure are lucky to live there, and to work with horses. That’s my dream! I read every word of this. Thank you so much for writing such an accurate description of Aiken. All the great attributes and reasons I moved here! Thanks for reading Suzy, I really enjoyed Aiken as I’m sure you can tell 🙂 You’re very lucky to live in such a beautiful place.